Brief Synopsis – A rookie cop begin to notice corruption in his precinct and must decide how to handle the situation. My Take on it – This is a film that a randomly chose for this blogathon based solely on the hope that the premise was as interesting as it seemed. The cast of this film is amazing and I’m so shocked that a film with such a cast list could be so mediocre. This film has an amazing premise that could work on numerous levels, but the fact that it is poorly executed hurts things so much. Michael Boatman is a weak lead actor and the fact that his character isn’t developed well enough for us to really care about him or what he does also hurts things a lot. 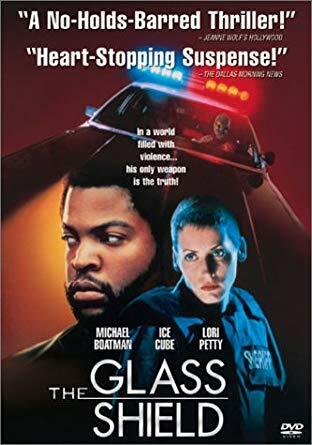 Lori Petty is completely underused in her role as a fellow young officer trying to find a way to stay away from trouble. The stand out among the cats is actually M. Emmett Walsh as a veteran police detective who must not only deal with a homicide buit also his own growing health issues. Seeing his performance here makes this film work watching even if he has limited screen time. The story could have been presented so much better and has been in other films which is quiet a shame. Bottom Line – So shocked that a film with such a stellar cast could be so mediocre. The overall premise is great, but the way this film executes the idea is done extremely poorly. The main character played by Michael Boatman isn’t developed well enough and it’s hard to truly care about what will happen to him or for that matter, what he will do. Petty is completely underused here as another cop who wants to change things, but also isn’t sure how to handle things even though she has a bit more experience in the precinct. Walsh stands out among the entire supporting cast as a veteran detective with medical issues, but even he feels underused here which could have made things much more effective. I’m with you in the sense that I had high hopes for this movie the first time I saw it because it has such a great cast. But it just doesn’t get there on so many levels. Thanks for contributing to this blog-a-thon!